As flowers begin to blossom and animals come out of their hibernation, one special herb to keep in mind this beautiful spring is Alfalfa. Some people shy away from smelling the flowers during Spring due to the allergies that come with it. More and more people each year are starting to be affected by the pollen released by trees, plants, and weeds. But instead of resorting to over the counter medications such as Claritin or Benadryl or simply avoiding all the beauty nature has to offer all together, why not try another method first? Simply try brewing a tea with Alfalfa. The word ‘Alfalfa’ translates to ‘father’ in Arabic which is well suited considering it also known as ‘The Father of all Foods’. Some may infer that Alfalfa translates to the word father due to its impressive natural ability to solve many problems within the body. Some might say that one of the many qualities of a father is to solve problems. Alfalfa is known to act like an antihistamine and stimulate for the immune system which makes it a great candidate to treat allergies. Alfalfa can be used to treat allergy symptoms such as sneezing, sinus congestion, runny nose and difficulty breathing. When it comes to having difficulty breathing, one could even use Alfalfa to treat asthma. Alfalfa is not only good for treating seasonal allergies, but is also great for the stomach and blood. When it comes to the stomach, it can help with the absorption and digestion of food. It also helps with weight gain, prostate inflammation, kidney conditions, bladder conditions, increase urine flow, high cholesterol, asthma, osteoarthritis, rheumatoid arthritis, diabetes, upset stomach, lower-back pains, insomnia, regular bowel movements, and increasing a mother’s milk, and even a bleeding disorder called thrombocytopenic purpura. Research has shown that it can lower high blood pressure and also decrease menopausal symptoms, such as cramping. Today, Alfalfa can be found in the form of tablets or capsules. Alfalfa sprouts is more frequently eaten the Alfalfa itself. 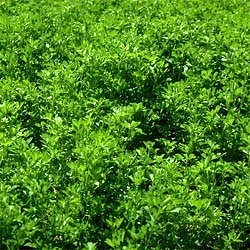 Every part of the Alfalfa plant is used to make herbal supplements. Alfalfa is great way to get one’s vitamins and minerals since it contains important ones such as amino acids, chlorophyll and fiber. When it comes to vitamins, Alfalfa contains Vitamins A, C, E, and K4. In Chinese Medicine, Alfalfa is used for kidney issues and digestive diseases such as Gallstones, Gastroesophageal Reflux Disease (GERD), Celiac Disease, etc. The tea is great for calming the nerves since Alfalfa is high in minerals. One of the best way to use Alfalfa is to use it as an infusion, in which the herb is simply infused in hot water. As one may know, Alfalfa is used in the tea given here at the Tree of Qi Acupuncture Clinic. It is one of many ingredients used in our tea. But here are two other ways in which one can make Alfalfa tea with specifically Alfalfa leaves or Alfalfa seeds. Method 1: make an infusion by using dried alfalfa leaves. Take one teaspoon of dried alfalfa leaves per cup of boiling water. Then, let steep for 10 to 15 minutes. Finally strain and drink. For people who suffer from seasonal allergies, mix dried Alfalfa leaves with dried Nettle leaves and drink the infusion twice daily for at least 2 weeks at the beginning or even before the beginning of allergy season. Method 2: Using Alfalfa seeds, take one teaspoon of crushed seeds for 4 cups of water, boil for 30 minutes and then strain and drink. This tea has a strong flavor so consider mixing it with peppermint or even ice. This drink could be great on a hot summer day. It is recommended to drink this tea a couple of days a week, and then two cups on the days you choose.